This page is an attempt to outline what I know about my Hendry ancestry in as "readable" format as possible. Please note whereas I try to ensure that what I publish is correct, and to differentiate between what is supported by documentation etc, and what is, in my opinion, a reasonable assumption, everything should be treated with caution. IF you have come across information that you believe is relevant to your own research please either verify it independently or drop me a line to confirm its validity. Equally if believe something is incorrect, or if you wish to add any details or discuss please get in touch using the Contact Form. Taken from the Christian name "Henry", and is most common in Ayrshire and the North-East. Supposedly a "sept" of the clans MacNaughton or Henderson. The furthest back we can trace our Hendry family tree with absolute certainty is to my great great great grandparents, Ebenezer Hendry and Margaret Donaldson, who whose marriage was recorded on 20 May 1804 in the parish register of Alloa, Clackmannanshire. They are recorded as parents on the subsequent death certificates of three of their children - Ebenezer (my great great grandfather), Margaret and Mary, and this is confirmed by the records of the births \ baptisms of these self same children to the couple in the Alloa Old Parish Registers. i.e. Ebenezer, born on 3rd March 1811, Margaret born on 23rd August 1812, and Mary born on 1st January 1815. 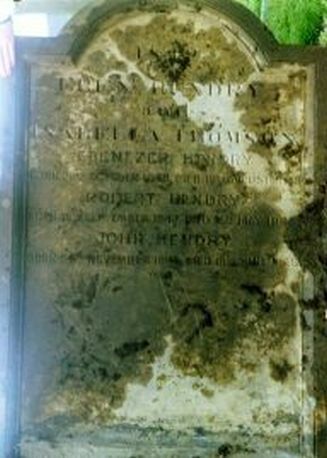 There is a headstone in Sighthill cemetry commemorating the husband of the aforementioned daughter Margaret Hendry, Thomas Kirk, which also commemorates the death of Margaret's father Ebenezer Hendry, - viz. "EBENEZER HENDRY his father in law Died 13th January 1849 Aged 66". This makes this Ebenezer's date of birth 1782 which fits with him being the Ebenezer Hendry recorded as born on 25 September 1782 in Alloa to John Henry, and Margaret Neil. When one adds to this the fact that Ebenezer and Margaret named their first born son, who was traditionally called after the paternal grandfather, John, it would seem reasonable to accept that Ebenezer was indeed the son of John Hendry, and Margaret Neil. HOWEVER one has to bear in mind that the age of the gravestone may not be entirely accurate. There was an Ebenezer Hen(d)ry whose birth\batism was recorded in the parish register of Clackmannan on 11 August 1776 the son of Ebenezer Hen(d)ry, a weaver, and Janet Blackwood who were married on 10th May 1771 in Tillicoultry. 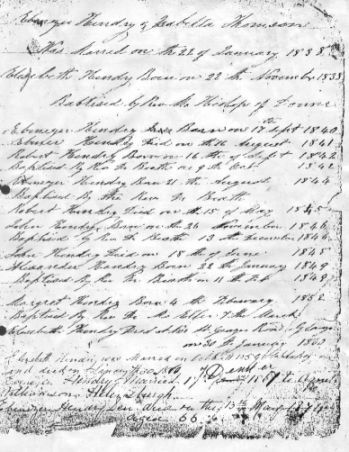 Obviously this Ebenezer would have been 72 in 1849, and also the names of the children of Ebenezer Hen(d)ry, and Margaret Donaldson do not fit the common naming pattern - first son would have been Ebenezer after the paternal grandfather, not John, and the second daughter would have been Janet after the paternal grandmother. This makes me inclined to discount this as a possibility but...... (Notes on Ebenezer Hendry who married Janet Blackwood and an Ebenezer Hendry who married a Margaret Fulton in and about Alloa - click here) HOWEVER there is one other alternative which is that the age is more or less accurate and Ebenezer 1 was born circa 1782 but his birth\baptism was never recorded or the record no longer exists. Obviously in this case we would be unlikely to be able to ascertain his parentage. All in all I am inclined to go with his parents being John Henry and Margaret Niel! Thomas Henry born on 4 January 1776 and baptised the 1st sabbath following. Father's occupation identified as a shoemaker. Robert Henry baptised on 1 October 1780. Ebenezer Henry baptised on 25 September 1782, (believed to be the next branch in our family tree). Margaret Henry born on on 26 July 1784, and baptised on 1 August 1784. Alexander on 16 April 1786. Alexander Henry on born\baptised 22 November 1790. (It is presumed that the first Alexander died in infancy) Father's occupation identified as a shoemaker. NOTE: Although the baptisms of James, Robert and Ebenezer have different dates they were all included together amongst the entries for January 1783 with a note by the parish clerk - "neglected to be registrated in their proper place until obliged.". It is also strange that no children were registered to the couple in the first 7 years of their marriage. Certainly there is an Alloa parish register covering this 7 year gap and this includes children born to couples whose marriages were recorded at the same time as John and Margaret, with some managing three children in this period. I would suspect the most likely explanation is that there were in fact earlier children but they were never registered, which seems possible especially considering the late registrations of James, Robert and and Ebenezer. This might suggest that John and Margaret had no real desire to register the baptisms of their children with the established church authorities, which was not uncommon at this time as registration in Church of Scotland's registers was costly and unpopular, so many people did not bother to register events at all. It is also possible that John and Margaret were members of one of the non-conformist congregations in Alloa at the time and had their children baptised accordingly, only registering the baptisms with the Established Church of Scotland when "obliged" to do so. HOWEVER taking the above in to account there are two children that potentially could be children of John and Margaret born in this seven year gap. This is VERY speculative and I would be pleased to hear from anyone who has proof one way or the other, or simply wishes to voice an opinion! As to the birth and parents of this John Henry who married Margaret Neil, no death\burial has been found which might supply an age at death and therefore an approximate date of birth. It would seem likely that he was born circa 1739-1751 going by the date of his wedding, but I have not uncovered any John Hen(d)ry's recorded as born between 1717 and 1751 as born in Clackmannanshire! So, he was either born elsewhere, his birth was not recorded or any record lost. However returning to the Ebenezer Hendry and Margaret Donaldson, their marriage was recorded on the 20th May 1804 in the parish register for Alloa where they were identified as "Ebenezer Henry of Alloa parish" and "Margaret Donaldson of St. Ninians parish", and the following year the birth of their first son John on 3rd March 1805 was also recorded in the Alloa parish register with his father Ebenezer identified as a "merchant". Over the next ten years a further four children were recorded in the Alloa parish register as born to Ebenezer Hendry 1 and Margaret Donaldson, Peter born on 18th August 1806, Ebenezer 11, the next generation in our family history, born on 3rd March 1811, Margaret born on 23rd August 1812, and Mary born on 1st January 1815. It is possible that the couple had other children who either died in infancy or their births were not recorded or if they were those records were lost. A correspondent to the Alloa Advertiser wrote a series of articles entitled Folk in Alloa whom I have known in 1867-1868 under the pseudonym Cobblecrock, which referred back to the Alloa of his childhood 50 years previous (circa 1818). In one of his "letters" written 23rd April 1867 and publised in the Alloa Advertiser of Saturday 27th April 1867, he makes mention of Ebenezer 1, in the section covering Mill Street to Candle Street. He identified him as a carter by trade, living in Mill Street, Alloa, between Mr. Forbes, a saddler, and John MacLean, also a carter. We have quite a bit of information on the early years of Ebenezer 11 from his later obituary. It would seem at the time of his birth his parents were resident in Broad Street, Alloa, as opposed to the later address assigned to them by Cobblecrocks article on Mill Street. Acording to the obituary Ebenezer 11 started out as an employee of Robert Hutton of the March Inn, and in that capacity he also became connected with, and in the employ of, the Stirling, Alloa and Kincardine Steam-boat Company, where one of his duties was the blowing of the "steam boat horn" on sighting the steamer. No doubt this was a vital task to ensure that the inhabitants of the town and any potential travellers were aware of it's immiment arrival. On the retirement of John Ewart, the well known driver of the Earl of March stage coach, the young Ebenezer literally took up the reins. The Earl of March Coach had started in 1824 taking passengers from Alloa to Glasgow, every morning, crossing at the ferry, and returning to Alloa in the evening. This was listed in Pigots and Co's National Commercial Directory of 1837 in the Alloa section as "To Glasgow, the Earl of Mar, from the Tontine Inn every morning, (Sunday's excepted), at six for Glasgow, across the ferry and goes by via Dunmore, and thro' Falkirk and Dennyloanhead." According to the later obituary "It was while acting in this capacity and being a general favourite with the passengers that Mr. Hendry made the neucleus of the wealth that he subsequently acquired." On 22nd January 1838, shortly after the succession of the young Queen Victoria, Ebenezer 11 married Isabella Thomson, the daughter of Robert Thomson, a shoemaker, and Elizabeth Smart. An announcement of the happy occasion was carried in the Stirling Observer on 1st February 1838. Six months later the Stirling Observer was carrying further news of Ebenezer 11, this time announcing that he had given up his job of driving the "Earl of Mar" stagecoach, and had taken over the running of the Star Inn. 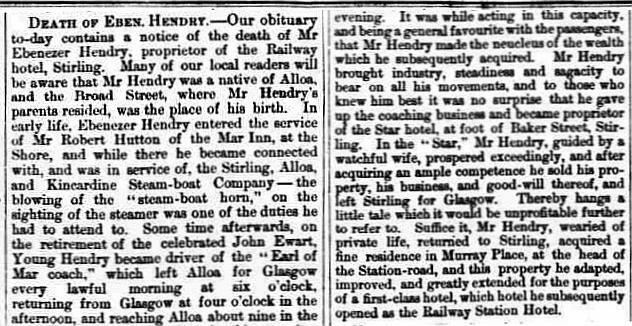 To quote once more from his later obituary "Mr Hendry brought industry, steadiness and sagacity to bear on all hs movements, and to those who knew him best it was no surprise that he gave up the coaching business and became proprietor of the Star hotel at the foot of Baker Street, Stirling." Mr. E. Hendry (late driver of the Earl of March Coach, between Glasgow and Alloa), begs respectfully to inform the Public in general that he has succeeded Mr. Wilson in the above Inn, and from attention to business he hopes to merit a share of public Patronage. Commercial Gentlemen may rely on being accommodated in a superior and economical manner. Saddled Horses, Gigs, Droskies, and Chaises, on the shortest notice. "In the 'Star', Mr Hendry, guided by a watchful wife, prospered exceedingly". It is interesting that the author should include the phrase "guided by a watchful wife", which might suggest that Isabella was the busines woman whilst Ebenezer made an excellent host!?! Dawson's original building. The name above the door is J.
photograph. However the site remains a hostelry. having been known previously as Broon's Bar. The career move away from stage coach driving into the hostelry and carriage hire proved a sensible one, for, with the increase in the canal network, and the advent of the railway, the writing was on the wall for the long distance stagecoach in Central Scotland. 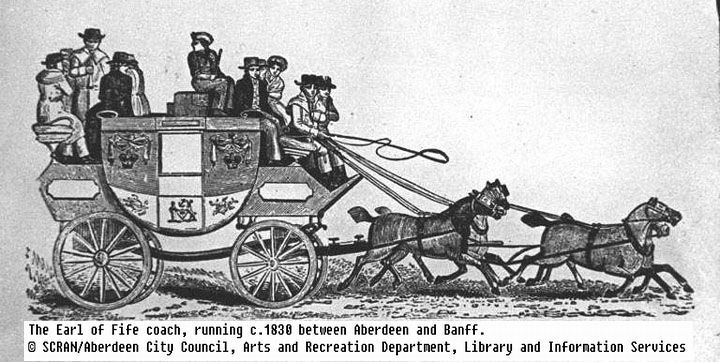 The book "Stagecoach to John O'Groats" refers to the "Earl of Mar" coach itself, and uses it as an example of the fate of the long distance stagecoach. It actually refers to the coach as owned by Mein's of 100 Trongate, Glasgow, and running from Glasgow to Tillicoultry, finishing at the Clackmannanshire Inn of "Pay the Day and Trust the Morn" with the driver being a Lowrie MacLaren. This must refer to the period after 1837 as the itinerary does not agree with Slater's Directory of 1837 and Ebenezer 11 is no longer the driver. Whether Mein's had owned the stagecoach when Ebenezer 11 had driven it or not I do not know. The book goes on to say that by 1844, (only six years after Ebenezer 11 had given up driving it), the "Earl of Mar" had been reduced to running a short-haul route between the railhead at Castlecary and Stirling, and by 1845 even that was ended. This change in travel was described by William Gibson in his book "Reminiscences of Dollar, Tillicoultry and other Districts adjoining the Ochils" starting on page 143 of chapter VII - Begin Business in Dollar. The first time I went to London by land (about 1841), there was no railway beyond Lancaster, and I had to coach it ' from Edinburgh (by Hawick, Langholm, Carlisle, and Kendal) to Lancaster ; and from thence to London by rail, taking part of two days and two nights for the journey, and costing between £5 and £6. Now the journey can be accomplished in ten hours, and a return ticket from Edinburgh got for about £2, 10s. Before the Edinburgh and Glasgow Railway was made, we had to walk to Alloa, and get the 'Earl of Mar' coach from there to Glasgow, taking five hours on the road. The coaches entered the city by Duke Street, High Street, and drew up at Mein's Hotel in the Trongate, a little to the west of the Tron Church, and on the opposite side of the street. After the Edinburgh and Glasgow line was opened (in 1842), an omnibus was started from Tillicoultry to Stirling (with Hugh Black for driver), and we got the coach (driven by Lowrie M'Laren) from there to Castlecary Station; and from Alloa the coach ran, by way of Dunmore, Airth, and Carron, to Falkirk Station. Thus gradually the benefits of railway travelling were approaching nearer us. When the Scottish Central line from Greenhill to Perth was opened (in 1848), the journey from Stirling to Edinburgh or Glasgow could be accomplished all the way by rail. Afterwards the Stirling and Dunfermline line was made, and then the Devon Valley; and thus the great iron roads which we now possess were gradually introduced into Scotland, and the old mode of travelling by the stage-coach done away with. The very expansion of the canal and railway network which was to result in the demise of the stage coach was also to herald a huge increase in tourism in Scotland and with Ebenezer's seeming "people skills" it is unsurprising that again to quote from the aforementioned obituary "In the Star, Mr Hendry, guided by a watchful wife, prospered exceedingly." It s interesting that the author to mention "guided by a watchful wife", which might suggest that Isabella was the busines woman whilst Ebenezer made an excellent host!?! Ebenezer 11 and Isabella had their first child, Elizabeth, on 22nd November 1838, and their second, a son, Ebenezer, followed almost two years later on 17th September 1840. The family still have a note of these and subsequent children along with their parents marriage. Who wrote the record is unknown but I suspect it was Isabella, their mother. As to Ebenezer senior it is possible that Margaret Donaldson his wife had died sometime after the birth of their daughter Mary in January 1815, as there is a mariage for an Ebenezer Henry to an Elizabeth Wright on 7 January 1839 in Alloa which could be "our" Ebenezer Hendry. This is based on the assumption that it is this selfsame Ebenezer and Elizabeth that are later recorded in the 1841 census at Old Bridge, Alloa with Ebenezer recorded as aged between 55 and 59 which would match with our Ebenezer who would have been 58. The only fact that does not sit quite right with these assumptions is the Ebenezer in the 1841 censuses occupation of "Agricultural Labourer" but....? We can however be certain about the whereabouts of Ebenezer 11 for the census of 7th June 1841. He was living along with his two young children at the Star Inn, Stirling. Whether the "Agnes Hendry" recorded is actually Isabella and a mistake by the enumerator, or whether Isabella was away and this Agnes was a relative of Ebenezer 11's is not known as relationships are not given in this census. There were also three male servants and three female servants employed at the Inn. Star Inn, Baker Street, Stirling. **In 1841 censuses all ages over 15 were rounded down to the nearest 5 - e.g.. 50 could be anything from 50 -> 54, and no relationships were given. Sadly the baby Ebenezer in this census was to die two months later, on 16th August 1841, aged 11 months. Over the next ten years Ebenezer 11 and Isabella had a further four children, Robert, born on 16th September 1842, another Ebenezer (111 and the next generation in our family history), born on 21st August 1844, John, born on 26th November 1846, and Alexander, born on 22nd January 1849. Sadly both Robert and John died in infancy, Robert on 15th. May 1845 aged 2 years and 8 months, and John on 18th June 1848, aged 19 months. 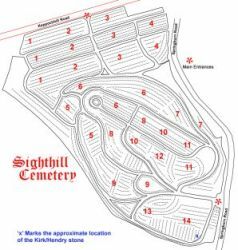 (For further details where known of the children of Ebenezer 11 and Isabella - Click here). 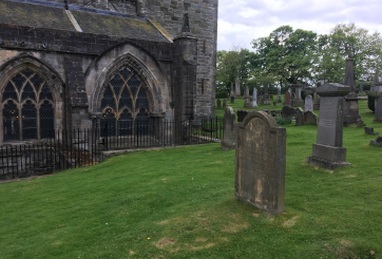 The children who died in infancy, Ebenezer, Robert, and John, were buried in a lair alongside Stirling East Parish Church. Unfortunately the headstone has fallen face-down, making the grave difficult to identify. However it was identified from a M.I. transcription for the burial ground obviously taken before the stone fell. Interestingly the children's uncle, their mother Isabella's brother, Robert Thomson, a mason, who died aged 48, on 5 March 1842 would also seem to be been buried in this lair. The fallen Hendry headstone in the Graveyard of Stirling East Parish Church. Although these personal tragedies must have been a blow, some solace at least must have been gained from the success of Ebenezer's businesses. With the aforementioned increase in the canal and railway network, (especially the latter), the 1840's saw a great expansion in trade, and also the beginnings of what is now the Scottish tourist industry. Ebenezer ll, like many of his generation, seems to have grasped the opportunity with both hands, not only managing the Star Inn, but also running a coaching business in conjunction with it. At Half-past Ten a.m. and a Quarter-past Three p.m. Inside and Cabin, 3s. ; Inside and Steerage, 2s. 6d. Outside and Cabin, 2s. 6d. ; Outside and Steerage, 1s. 6d. CHAMPION to Crieff and Perth at Half-past One p.m. OMNIBUS to Alloa at a Quarter to Five p.m.
At Seven, and Half-past Nine a.m.
Quarter to Two, and Five p.m.
Quarter-past Eight, and Ten a.m.
Half-past Two, and Eight p.m. Passengers are booked from Glasgow to Bridge of Allan, via Canal, at Nine a.m., and Twelve Noon, and from Bridge of Allan to Glasgow, at Ten a.m., and Half-past Two p.m.
Fares for the whole distance - Cabin and Inside, 3s. 4d. ; Steerage and Outside, 2s. 1d. 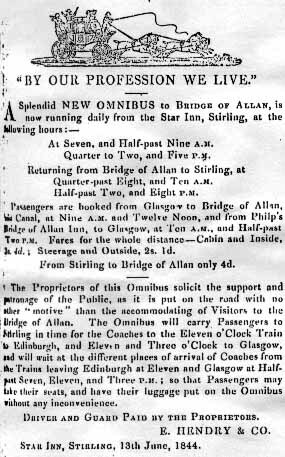 The proprietors of this Omnibus solicit the support and patronage of the Public, as this Omnibus is put on the road with no other "motive" than the accommodating of Visitors to Bridge of Allan; and the Proprietors beg also to state that the omnibus will convey Passengers to Stirling in time for the Coaches to the Eleven o'Clock Train to Edinburgh, and Eleven and Three to Glasgow, and will wait at the different places of arrival of the Coaches from the Trains leaving Edinburgh at Eleven and Glasgow at Half-past Seven, Eleven, and Three o'Clock; so that Passengers may take their seats, and have their luggage put on the Omnibus without any inconvenience. In the Stirling Observer of 6th September 1844, as well as advertising the Forth and Clyde Canal Coaches which already ran from the Star, Ebenezer was advertising his own Omnibus to Bridge of Allan, connecting with the Edinburgh and Glasgow trains. It would seem that the coach and horses hire part of the Star Inn's business was Ebenezer 11's own, E. Hendry & Co., and was expanding. "BY OUR PROFESSION WE LIVE." Quarter-past Eight, and Tem A.M. Passengers are booked from Glasgow to Bridge of Allan, via Canal, at Nine A.M. and Twelve Noon, and from Philp's Bridge of Allan Inn, to Glasgow, at Ten A.M., and Half-past Two P.M. Fares for the whole distance -- Cabin and Inside, 3s. 4d. ; Steerage and Outside, 2s. 1d. From Stirling to Bridge or Allan only 4d. the Trains leaving Edinburgh at Eleven and Glasgow at Half-past Seven, Eleven, and Three P.M. ; so that Passengers may take their seats, and have their luggage put on the Omnibus without any inconvenience. STAR INN, STIRLING, 13th June, 1844. 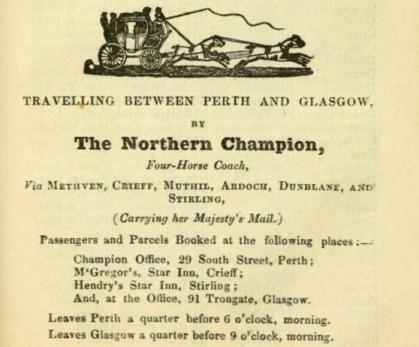 The Perth Post Office Directory of 1845-1846 also records the fact that the stagecoach from Perth to Glasgow "The Northern Champion" stopped at the Star in Stirling to disembark \ embark passengers and parcels, which would no doubt create additional income for the business. As already alluded to in the preface, Ebenezer 1 died on 13 January 1849, aged 66. This fact is recorded on a headstone in Sighthill Cemetry in Glasgow, belonging to his son in law Thomas Kirk husband of his eldest daughter Mary. The headstone does not record where he died but if the assumptions about his second marriage to Elizabeth Wright and subsequent record of them resident in Alloa for the 1841 census are correct one would assume he actually died and was interred in Alloa. His age, given as 66, confirms him as the Ebenezer Hendry born 25 September 1782. Elizabeth Hen(d)ry nee Wright died on 10 June 1856. 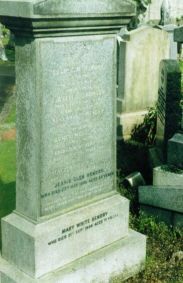 Although the record of her death does not specifically identify her as the widow of Ebenezer Hendry she is identified as a widow with the maiden name of Wright and living at Old Bridge Street, Alloa, which would seem to be reasonable grounds for believing this is Ebenezer's widow. She is recorded as buried in the Churchyard of Alloa. For the census of 31st March 1851 Ebenezer and Isabella were once again recorded at the Star Inn. As well as their three children, three servants, and a guest, they had a John Dawson aged 17, a printer's apprentice and a Agnes Dawson aged 15, recorded as relatives, staying with them. As previously mentioned, the Star was owned by a Dawson family, and the suggestion that Ebenezer was helped in gaining the tenancy by kinship connections either of his own or, more likely, his wife's, is not unreasonable. 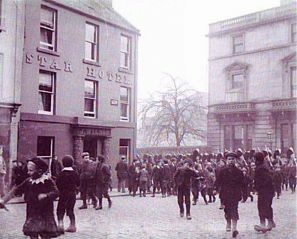 The fact that the "Star" was a reputable and popular establishment is borne out by a report in the Stirling Observer of 3rd June 1851 on a farewell dinner held there in honour of a Mr. Fenton which states : - "It is almost needless to add that the supper which was of a very superior kind, amply sustained the well known respectability of Mr. Hendry's establishment." Ebenezer 11 and Isabella had their seventh and final child, Margaret, born on 4th February 1852. Over the next few years Ebenezer's business seems to have been going well. Well enough, at least, to make him worth robbing, for the Stirling Observer of 19th April 1855 reports the sentencing of a James Wilson or Rennie to 9 months imprisonment the procurator fiscal, Mr. Sconce, for stealing silver plated carriage rods from one of Ebenezer's coaches! 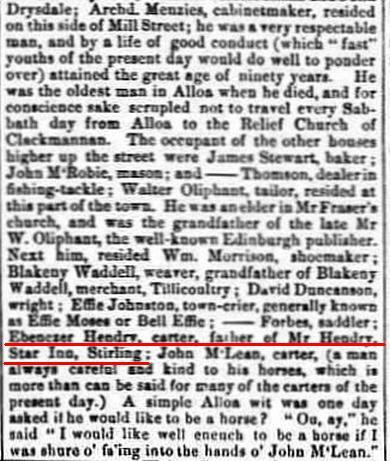 Also in 1855 Ebenezer 11 was investing in the business as was noted by a reporter for the Stirling Observer, and confirmed by an announcement by Ebenezer 11 himself in the same paper. EBENEZER HENDRY has pleasure in stating that, for the greater accommodation of COMMERCIAL GENTLEMEN, and to render his hotel more worthy of their patronage, and that of their Families and the general Public, he has lately, at considerable expense, caused a large addition to be built to his Hotel. 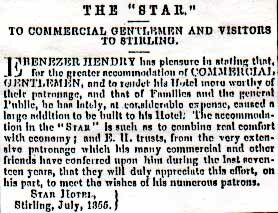 The accommodation in the "STAR" is such as to combine real comfort with economy ; and E.H. trusts, from the very extensive patronage which his many commercial and other friends have conferred upon him during the last seventeen years, that they will duly appreciate this effort, on his part, to meet the wishes of his numerous patrons. ALL AND WHOLE, the just and equal half, pro indiviso, of the SUBJECTS situated on the West side of BROAD STREET, Alloa, belonging to Mr. EBENEZER HENDRY, Innkeeper in Stirling, and occupied by James Hendry and others. Rental, £10 ; Feu Duty, Four Merks Scots, or 4s. 4d. Sterling or thereby. Offers to be lodged with, and information given by, JOHN WATSON, Writer, No. 7 March Street, Alloa, in whose hands are the title deeds of the property. ALL and WHOLE, that TENEMENT of HOUSES with the STABLES and GARDEN GROUND behind the same, situated on the West side of Broad Street, Alloa, belonging to Mr. EBENEZER HENDRY, and the heirs of Mrs Mary Hendry, or McEwan, and occupied by David Drysdale and others. For particulars apply to Mr Alexander Thomson, Hosue Factor, No. 14, March Street; or to John WATSON, Writer, No. 7 March Street, in whose hands are the Title Deeds of the subjects, and with whom offers are to be lodged on or before the 31st Curt.. In the Stirling Observer of 31st July 1856 the Star receives mention as the venue for the Stirling Boating Club Dinner. Once again the dinner receives praise, being described as "excellent and substantial". The occasion itself seems to have been a success, with "toasts, sentiments, and songs enlivening the proceedings". Meanwhile throughout this period of the mid and late 1850's, Ebenezer 111 was receiving his education at the old Stirling High School in Cowanes Yard under the guidance of William Young and Duncan McDougall. On the 11th October 1859, Elizabeth, the eldest daughter of Ebenezer 11 and Isabella, married John Rogerson a merchant with Alexander Paton & Co., soft goods merchants. The marriage took place in Stirling, and the fact that one of the witnesses was an Alexander Paton, presumably of Alexander Paton & Co., suggests that John Rogerson was an important part of that firm, if not a partner. Sadly, on 30th January 1860, after only three months of marriage, Elizabeth died of jaundice. 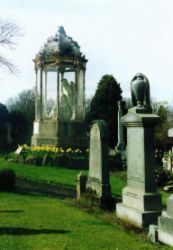 She was living at the time at 101 St. Georges Road, Glasgow, and was buried in the Glasgow Necropolis on 2nd February. Presumably as a result of this marriage that Ebenezer 111, her brother, was found a position with the same Alexander Paton & Co. in Glasgow, as an accounts clerk in or around 1860. He had attended St. Andrews University for a year after leaving school, but what he had studied and why he was only there for a year is not known. For the census of 1861 Ebenezer 111, was staying with his parents, and his younger brother and sister, at the Star in Stirling. I am assuming as he is recorded as an "accountant's apprentice", that he had already taken up employment with Alexander Paton & Co. in Glasgow, but was at home, possibly for the Easter holiday. Between 1861 and 1867, whilst Ebenezer 11 continued the successful running of the "Star", Ebenezer 111 worked on at Alexander Paton's in Glasgow. He seems to have been the kind of young man who would have enjoyed the bachelor life, and was a great sportsman. It was during this time that he started playing for Clydesdale Cricket Club, whose ground at this point was in Kinning Park, on the site of what is now the Glasgow Rangers Football Club ground. Ebenezer 111 remained a member of Clydesdale Cricket Club until his death in 1914. In 1865 Ebenezer Hendry, Star Hotel, was voted in as a director of the Midland Property Investment Society. This information is included in an article in the The Stirling Observer of 26 January 1865 concerning a meeting of the group in "Hendry's Star Hotel". In itself this is of interest suggesting as it does that Ebenezer had an eye to a profit outside of the Hotel and Carriage business and was respected enough to be elected as a Director. However what is also significant is the other director who was chosen to serve alongside Ebenezer. i.e. Robert Adam, Corkcutter. 50 years later my grandfather John Williamson Hendry was to marry a Robina Adam in Glasgow. It would seem reasonable to assume that their liaison was a result of links between the two families that stretched back to at least the time that Ebenezer and Robert were working together as directors, and it seems highly likely that the links went back earlier that this as Robert's father, James Adam was a local Blacksmith \ Coachsmith. The same age as Ebenezer, although born in Glasgow, James had lived in Stirling from his early twenties, and taking into account Ebenezer's coaching\hostelry background and businesses it is more than reasonable to assume they were acquainted. Editor's Note - One assumes that D.Duff would have been "Man of the Match", if such a thing existed in those days !! The marriage took place in Helensburgh, and there are two items of note on the wedding certificate. Firstly Hugh Douglas Rogerson, the younger half-brother of the previously mentioned John Rogerson, and of a similar age as Ebenezer 111, was one of the witnesses. Secondly Ebenezer 11, the groom's father, is listed as having "no profession". 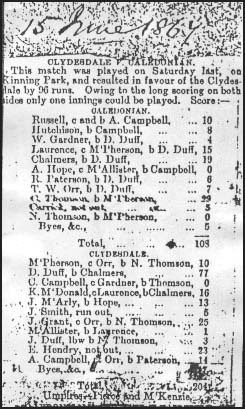 This was because he seems to have left the "Star" sometime earlier in the year, and moved to Glasgow, latterly in St. Georges Square..
Ebenezer 111 and his new wife set up home at 256 Dumbarton Road, but Ebenezer 111 did not let marriage interrupt his sporting life playing not only cricket at Clydesdale, but also football. Reports of the time suggest that he was a regular and valued player in both sports. 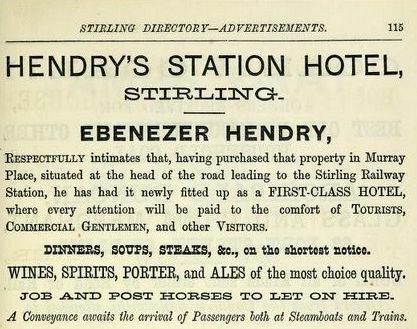 On 10th June 1868 Ebenezer 11 bought the building at 54 Murray Place, Stirling, and in the November of the same year he opened it as the "Station Hotel". 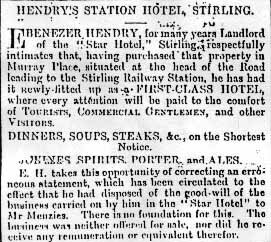 It is interesting that in an advert placed in the Stirling Press and Advertiser announcing the opening of his new hotel, Ebenezer 11 took the opportunity of refuting a rumour that he had accepted a sum of money from the incoming tenant of the "Star", a Mr Menzies, for the "goodwill of the business". EBENEZER HENDRY for many years Landlord of the "Star Hotel", Stirling, respectfully intimates that, having purchased the property in Murray Place, situated at the head of the Road leading to the Stirling Railway Station, he has had it newly fitted-up as a FIRST CLASS HOTEL, where every attention will be paid to the comfort of TOURISTS, COMMERCIAL GENTLEMEN, and other VISITORS. DINNERS, SOUPS, STEAKS, &c, on the Shortest notice. WINES, SPIRITS, PORTERS, and ALES. According the the following article in the Falkirk Herald of 19 November 1868 it would also appear that that Ebenezer had some difficulty in getting the burgh magistrates to grant him a hotel licence for his new establishment with 120 objectors!. However Mr. McLuckie his lawyer and family friend seems to have swayed the magistrates in favour 14 to five. By 1871 Ebenezer 11 was no doubt making as much of a success of the "Station Hotel" as he had done of the "Star", except now as owner, not tenant. It is at his new hotel that we find him and his wife for the census of 3rd April 1871. Their youngest daughter Margaret, now 19, is still at home, and a Margaret Craig is amongst the guests. This Margaret Craig was an aunt of Agnes Williamson, Ebenezer 11's daughter-in-law. Station Hotel, 54 Murray Place, Stirling. Back in Glasgow, Ebenezer 111 was now the father of two children, Ebenezer 1V, born on 25th January 1869, and Jean Glen, born on 16th August 1870. At the time of the census of 3rd April 1871, he, his wife and two children, were staying with his in-laws at the Queens Hotel, Helensburgh, possibly for the Easter holidays. As can be seen in this census both Ebenezer and Agnes's first children were born in Helensburgh, not at home in Glasgow. 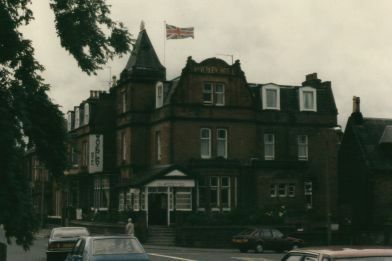 Queens Hotel, East Clyde Street, Helensburgh. Just over a year after this census Ebenezer 111 and Agnes had their third child, a second daughter, Isabella, born on 8th July 1872, but despite his growing family Ebenezer 111's sporting life seems to have continued unabated, and at the inaugural meeting of the Scottish Football Association he had the honour, along with another Clydesdale player William Gibb, to be voted onto the committee. Clydesdale also provided the President in Archie Campbell. Unfortunately, seven weeks after this event, on 13th May 1874, Ebenezer 11, aged 66, died of heart disease in Stirling. The Alloa Advertiser of carried an announcement of his demise and a brief obituary. The line towards the end "Thereby hangs a little tale which it would be unprofitable further to refer to". 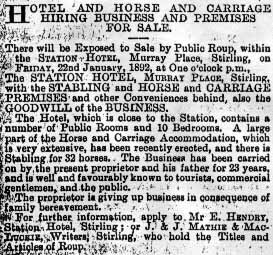 presumably referes back to the accusation he disposed of the good-will of the business carried on by him in the "Star Hotel" to Mr. Menzies, refuted at the time in the advert announcing the opening of the Station Hotel. Ebenezer 111, remained in Glasgow until after the birth of his fourth child, Elizabeth, who was born on 30th May 1874, after which he left his job and his friends at Alexander Paton & Co., and returned to Stirling to help his mother in the running of the Station Hotel. On the occasion of his leaving Alexander Paton & Co. Ebenezer 111 was presented with a elaborate punch-cup stand by his friends there. The base of this is still in the family. Once back in Stirling Ebenezer 111 set up home at 19 Princes Street. On 27th January 1875, his youngest sister, Margaret, married Charles Hercules Reynolds, an engineer, the son of Charles Reynolds, a hotel keeper, and Charlotte Hands. He was living at 6 Radnor Terrace, Sandyford, Glasgow, at the time, although the marriage took place in Stirling. John Rogerson crops up again as one of the witnesses, and it is possible that, with her father being dead, he gave the bride away. Amongst their wedding presents was a handsome family bible from Mr. and Mrs. McLuckie, which, for some reason, is in the possession of our family. Sometime the following year a Mr. John Sutherland was laid up at the hotel as the result of some kind of accident, as, on the 31st January 1876, he sent a copy of the "Plays and PoemsWilliam Shakespeare" from London, inscribing the front page with - "To Mr. Ebenezer Hendry in remembrance of the kind attention shewn by him to one, whilst I was laid up by an accident at the Station Hotel, Stirling". This is also still in the family's possession. 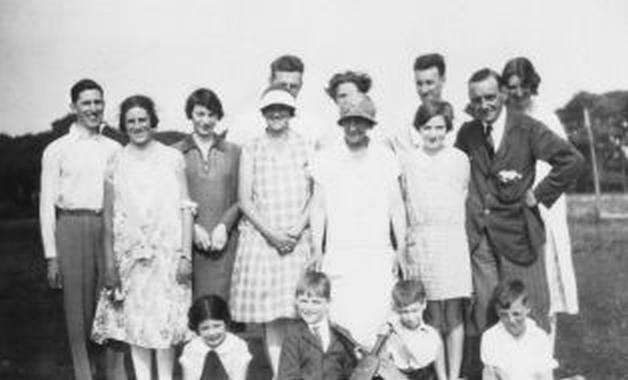 By the end of 1877 Ebenezer 111's family had grown to six, with the addition of Alexander, born on 23rd February 1876, and Agnes, born on 9th December 1877. 1878 was a disastrous year for Ebenezer 111. On 6th August 1878 his younger brother, Alexander, aged 29, and as far as is known unmarried, committed suicide. A precognition found that he had taken his own life at the Station Hotel by "Suicidal Poisoning having swallowed an ounce or thereby of Laudanum". Why he should have taken his own life was not recorded and at this moment in time remains a mystery. Eight weeks later, on 1st October 1878 the City of Glasgow Bank, in which Ebenezer 111 had one £100 share, went bankrupt. It was found to have debts of £12,400,000 against assets of only £7,200,000, and as it was not a Limited Company, (not uncommon in those days), the Shareholders were personally responsible for this debt. 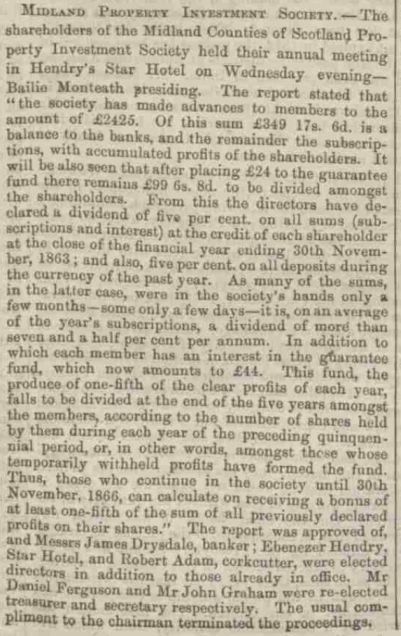 This meant that not only was Ebenezer 111's £100 share worthless, but that he, along with the rest of the Shareholders would be held liable for £2,750, per £100 share held, a substantial sum of money in those days. Ebenezer 111 did manage to raise the money and stay solvent, seemingly by borrowing against a trust set up by his late father. When the affairs of the Bank were settled some four years later, on 1st October 1882, he was one of only 254 out of the 1819 original shareholders to avoid bankruptcy. Finally, on 9th December 1878, his mother, Isabella Thomson, died aged 71, according to her death certificate. The death certificate also records the fact that she had been paralysed for a month and one cannot help but wonder if the suicide of her younger son and the financial disaster that had beset her elder son were contributory factors in her demise. 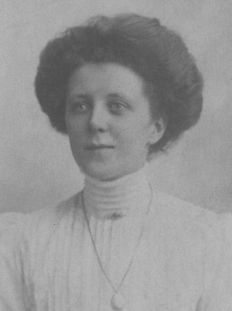 The following year Ebenezer 111 and Agnes had their seventh child, a daughter Margaret, born on 8th September 1879. Her birth is recorded at 54 Murray Place, the Station Hotel itself, but some time after Margaret's birth the family seem to have taken up residence 52 Murray Place, next door to the hotel. Possibly Ebenezer 111's expanding family was taking up too many potentially paying rooms !! Certainly by the census of 1881, although Ebenezer 111 and Agnes are still listed at the Station Hotel, 54 Murray Place, the children, along with their nurse, are listed next door at 52 Murray Place. Eleven months after this census, on 8th February 1882, Ebenezer 111 and Agnes had their eighth child and third son, John Williamson Hendry, my Grandfather, who was born next door to the Station Hotel, at 52 Murray Place, Stirling. Over the next five years Ebenezer 111's family continued to grow, with the births of Robert on 9th November 1883, Helen on 19th May 1885, and, lastly, Mary on 9th July 1887. The final score was 11 children, (4 boys and 7 girls), over 20 years. 1891 started inauspiciously with the sad death of Jean Glen, Agnes's mother, who died on 5th January, aged 70, in the Queens Hotel in Helensburgh. In March 1891 Ebenezer 111 was elected president of the Albert Place Bowling Club. It would seem that since his return to Stirling from Glasgow, Ebenezer had continued to indulge his love of sport, being a member of Stirling Castle Curling Club, and Stirling County Cricket Club, as well as the Albert Place Bowling Club. He was also a regular spectator at Kings Park F.C. 's matches. STIRLING CLUB.- The annual meeting of this club was held on Thursday night, when the following office-bearers were elected for the ensuing year:- President, Mr E. Hendry ; vice-president, Mr R. Cairns ; secretary, Mr H. Robb ; treasurer, Mr R. Walker ; directors, Councillor W. Crawford, Messrs Thomas Wilson, W. Paton, Jas. Brown, T. Gentles, senior, H. M. Kirkwood, and Jas. Thomson. Councillor Crawford presided at the meeting, and the turnout of members was large. During his time in Stirling Ebenezer never seems to have entertained ambitions in the sphere of local politics, although he was an elder in the Stirling East Parish church under the Rev J. P. Lang. His one foray into public affairs was sports related, of course, being to do with the provision of new swimming baths. For the census of 3rd April 1891, Ebenezer 111 and Agnes were recorded as living, along with 9 of their 11 children, at the Station Hotel, 54 Murray Place, 52 Murray Place seemingly having been relinquished. Ebenezer 1V, and Isabella, who would have been aged 22 and 19 respectively, are not recorded. Isabella was visiting her Aunt Margaret and her husband Charles H. Reynolds, a Naval Architect, in Longbenton, Northumberland (see "Further details of the children of Ebenezer Hendry and Isabella Thomson"). Ebenezer was and may have flown the nest by this time. Sadly six months after this census, on 11th October 1891, Agnes Williamson, Ebenezer 111's wife, died of " a malignant disease in the abdomen", aged only 47. To make matters worse the following month her father, Alexander Williamson died, aged 77, on 17th November 1891, in Helensburgh, only eleven months after the death of his wife, Jean Glen. No doubt devastated and now a widower with 9 children, Ebenezer 111 decided to quit the hotel business and at the end of 1891 put the Station Hotel up for sale by "public roup", (auction). There will be exposed to Sale by Public Roup, within the Station Hotel, Murray Place, Stirling, on Friday 22nd January, 1892 at One O'clock p.m. 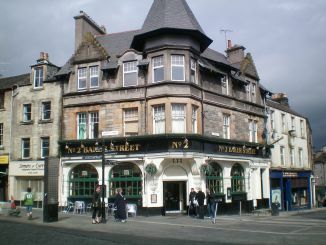 The STATION HOTEL, Murray Place, Stirling, with the STABLING and HORSE and CARRIAGE PREMISES and other conveniences behind, also the GOODWILL of the BUSINESS. The Hotel, which is close to the Station, contains a number of Public Rooms and 10 Bedrooms. A large part of the Horse and Carriage Accommodation, which is very extensive, has been recently erected, and there is stabling for 32 horses. The business has been carried out by the present proprietor and his father for 23 years, and is well and favourably known to tourists, commercial gentlemen and the public. The proprietor is giving up the business in consequence of family bereavement. For further information, apply to Mr E. HENDRY, Station Hotel, Stirling ; or J. & J. MATTIE & MCLUCKIE, Writers, Stirling, who hold the Titles and Articles of Roup. In January of 1892, with the sale by public roup having failed to produce a purchaser, Ebenezer sold the Station Hotel to Mr. James Lennox, proprietor of the Golden Lion Hotel for £5400. SALE OF THE STATION HOTEL.- Mr. Hendry's Station Hotel, which was exposed by public roup on Friday but which failed to find a purchaser, was sold privately on Tuesday to Mr. Lennox, Golden Lion Hotel, along with the goodwill of the business for £5400. The Station Hotel in Stirling after its sale to James Lennox circa 1900?? With the Station Hotel sold Ebenezer took temporary residence at a large house called Beechwood (now council offices), in Newhouse, Stirling, possibly deciding what to do next. Despite the sad circumstances that occasioned it, Ebenezer 111 must have been heartened by the "Complimentary Dinner" held by his peers to mark the occasion of his retiral from the Station Hotel. After about a year in residence at Beechwood, Ebenezer 111 moved with his family back to Glasgow, to become a partner with Gilmour & Co. Silk Merchants. He and his family took up residence at 284 Maxwell Drive, Pollokshields, on the south -side of Glasgow. No doubt Jean Glen, his eldest daughter, would have been the mistress of the household, whilst her younger brothers and sisters continued their education, the girls attending Albert Road Academy, and John Williamson Hendry at least, attending Hutcheson's Academy. Ebenezer 111 meanwhile returned to Clydesdale Cricket Club, membership of which he had maintained during his time in Stirling, and in 1898, at the dinner to celebrate the Club's Jubilee, he was one of the croupiers. At the time of the 1901 census the family were still resident at 284 Maxwell Drive, Pollokshields. Wilhemina Murdoch Servant 18 General Servant (Domestic) Islay, Argylshire (G&E). In 1907 Ebenezer 111 retired from business, and bought the Waverley Hotel, in Dumfries. The Hotel was purchased from Mrs. Cameron for £5200. This was no doubt to provide for his eldest daughter, Jean Glen, who seems to have been "house-keeper" for him since the death of his wife, and Mary his youngest daughter. SALE OF A DUMFRIES HOTEL.- We understand that the Waverley Hotel, Dumfries, has been sold by Mrs Cameron to Mr. Ebenezer Hendry, merchant, 284 Maxwell Street, Pollokshields, Glasgow, for £5200. Messrs J. Henderson & Sons, solicitos, Dumfries, were the agents fo the seller ; and Messrs Finlay, Smith & Fulton, solicitors, Glasgow, agents for the purchaser. For the census of 1911 Ebenezer was recorded along with his eldest and youngest daughters, Jean Glen and Mary White at 3 York Place, St. Mary's, Dumfries, the Waverley hotel. It was recorded as having 24 rooms with 1 or more windows and 4 live-in servants were also listed in the household. In Dumfries Ebenezer 111 of course joined Dumfries Cricket Club, and settled down to his retirement. He died seven years later, on 2nd April 1914, at the Waverley Hotel, shortly after paying his 50th annual subscription to Clydesdale Cricket Club to which he had still retained his membership. The Stirling Observer carried an obituary. Ebenezer 111 was laid to rest in the family grave in Stirling alongside his father, mother, and wife. 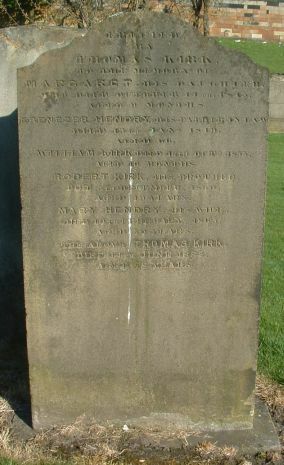 The second Hendry grave in the graveyard of the Stirling East Church. In his will he named Jean Glen Hendry and Mary Hendry as his executors, leaving an estate valued at £773 18s. 2d. and the running of the Waveley Hotel passed to his eldest daughter Jean Glen Hendry. the hotel in a very efficient and able manner..
By the time of his father's demise, John Williamson Hendry, had qualified as a solicitor through the profession. He was living in Pollokshields at 3 Nithsdale Place, and was, of course, a member of Clydesdale Cricket Club. The first record of him practising his profession is his listing in the Glasgow Directory of 1911, practising law at 121 Bath Street. By 1912 he had moved to 191 West George Street, and by 1914 he had moved again, this time to 108 West Regent Street, and was listed as Hendry & Husband. Of course at this time the Great War was raging in Europe and John Williamson Hendry was recorded on his marriage record as "Writer (Cadet Officer - Cadet Battalion)". It is unknown whether he was already a member of the Territorial force prior to the war or whether he had volunteered\been conscripted sometime after the outbreak. One would assume the photograpgh was taken as part of the passing out ceremony and therefore dated just prior to his JWH's marriage to Robina. One wonders how many of these faces survived the war? 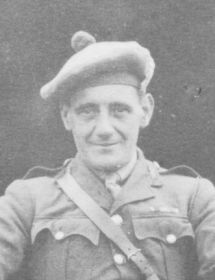 However by January 1918 he was a commissioned officer, 2nd Lieutenant, in the 9th (Glasgow Highlanders) Battalion H.L.I. and on 24th January 1918 he joined the regiment at Alnwick Camp, Potljze, near Passchendal , Belgium, on the Western front and was assigned to B Company. At this time the British army were increasingly short of officers as they suffered a higher casualty rate and this may be reflected in John W seeing active service despite being 36. After a fairly quite first few weeks the Battalion was moved back to the front near Passchendale where they remained seeing sporadic action throughout March. By the 7th April the Battalion was in billets at Izel-les-Hameau awaiting a move to the south in support of troops who had been hard pressed containing a German assault in the Vimy Ridge \ Amiens areas. On the 10th April they set of but had gone no more than a couple of miles when they were ordered back and re-directed to the north where the Germans had launched a fresh offensive on the northern front around the Bassee Canal. The battalion was moved north and took up positions in the Bailleul \ Neuve Eglise area. Over the next few days it took part in some fierce fighting and seems to have played a major role in stemming the German advance in that area. 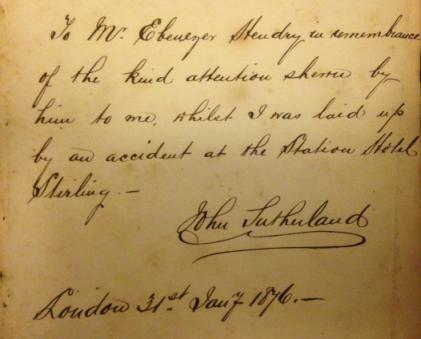 Unfortunately John W was wounded on the 13th April and it is assumed was taken to the rear. 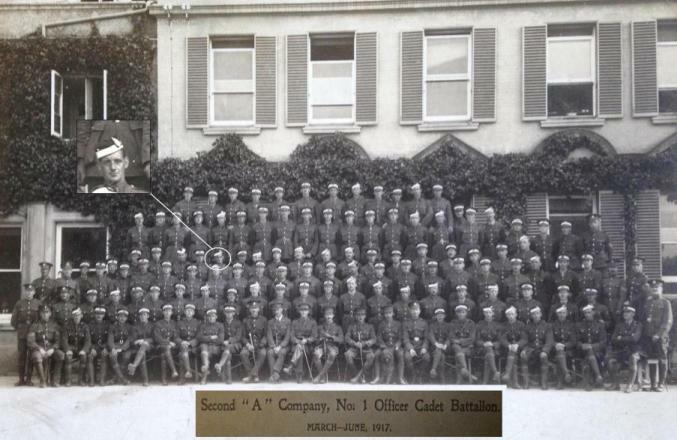 By the time this particular phase of operations was completed on 20th April 1918 with the battalion’s move to billets at Noordpeene the casualties list was - Killed: Officers 7, Other Ranks 60. Wounded: Officers 13, (including 2 at duty), Other Ranks 172. Missing: Other Ranks 154. I suspect, as a result of his wounds, John W never returned to active service in France. On his recovery and the cessation of hostilities he resumed his law practice, and hopefully life settled down to normal domesticity. John W did however remain an active member of the Glasgow Highlands for years thereafter. The previous information was extracted from "The War Diary of the 9th (Glasgow Highland) Battalion Highland Light Infantry - 'the Glasgow Highlanders' 1914 to 1919" as transcribed by Alec Weir(WO 95 1347 and WO 95 2431.) and "Shoulder to Shoulder - The Glasgow Highlanders 9th. Bn. Highland Light Infantry 1914 -1918" by Colonel A. K. Reid, GB, CBE, DSO, MC, TD, DL. Both books can be found online at the Royal Highland Fusiliers website http://rhf.org.uk/rhf in the online books section. There is obviously a lot more detail in these sources. Equally I have some The Hendrys and the Glasgow Highlanders web pages with additional information as not only did John W serve in the First War but my father also saw service in the Second War and was active with the regiment thereafter. Two years later, John and Robina had their one and only child, my father, James MacGregor Gordon Hendry, born 21st March 1919. He was named after the husband of Jane Burns, Robina's sister, as a mark of gratitude for taking Robina in as part of their family after Robina's mother's death, and the kindness shown to her. I suspect this may have been taken during family holidays at Lochranza on the Isle of Aran. John W Hendry is on the far right and Robina second on his left with her hands resting on the heads of two of the boys sat at her feet. I am unsure which of the boys sitting on the ground is James McGregor Gordon Hendry. I suspect that he is at the feet of his father although he could also been the young lad by Robina's right hand with the jacket, tie and cricket bat.